EFM Health Clubs bridges the gap between a conventional gym (where you typically get access to the gym with minimal help & support) and a Personal Trainer (which for most people is simply not an affordable long term option to stay motivated with your exercise regime). Boxing, pre and post-natal training, 1 on 1 and group personal training, kettlebells, suspension training and rehabilitation. 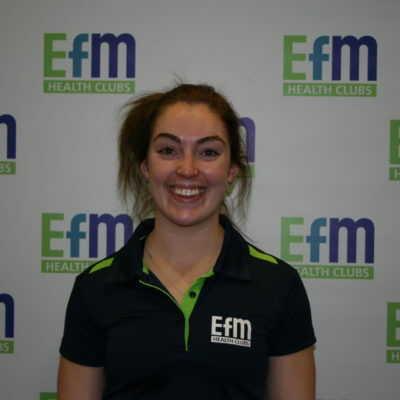 My name is Courtney and I will be your EFM coach. I have recently become part of the fitness industry as a career change but have always been passionate about fitness and health. I have experience in personal training along with my qualifications of certificate III and IV in fitness, master trainer, boxing, pre and post-natal, kettlebells, suspension training and rehabilitation. I have worked with weight loss, muscle gain, injury rehabilitation and athletes, all wanting to achieve specific goals. I look forward to you jumping on board to achieve your goals too!